As you know, I believe in using what you have. I used leftover lentils I had in the fridge, I cooked up some dried Adzuki beans, and since I didn’t have any fresh jalapenos, I used a can of Rotel tomatoes with chilis. Of course, I didn’t use the oil. Instead, I just swapped it out with vegetable broth. My husband couldn’t stop eating this. 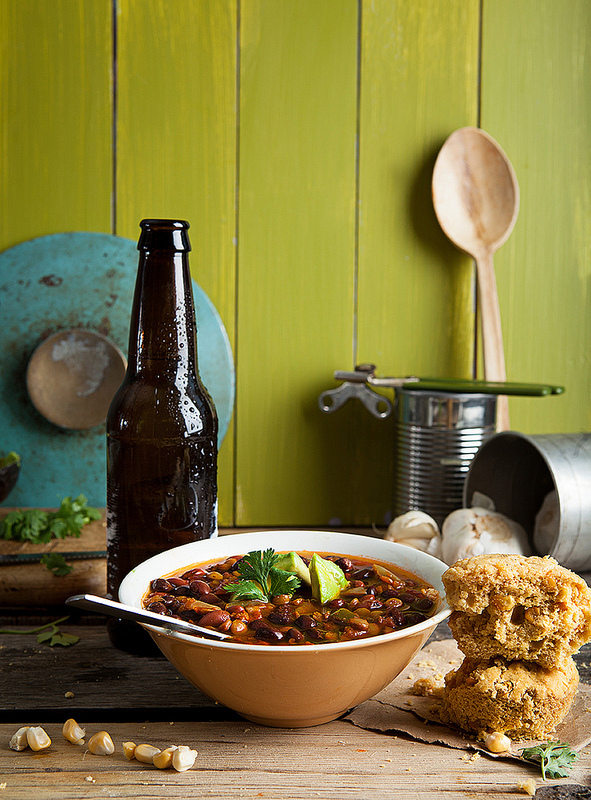 He says it’s the blending of the savory flavors that make it the best chili he has ever tasted! 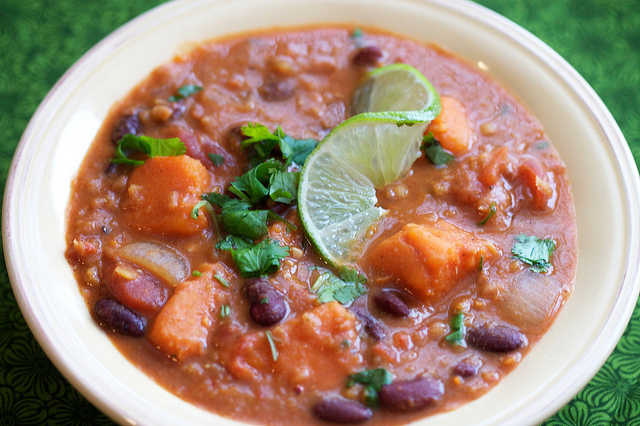 Isa’s recipe is here: http://www.theppk.com/2010/12/red-lentil-thai-chili . I, of course, changed it. As always, I didn’t use the oil. Instead I used vegetable broth. I didn’t have red lentils, but I did have leftover green lentils. (How much do the colors really matter anyway?) I also was out of onions, red bell pepper, and cilantro, so I just omitted them. Instead of kidney beans, I cooked up some Adzuki beans. As a swap for lite coconut milk, I just used unsweetened soy milk with coconut extract mixed in it. Delicious! 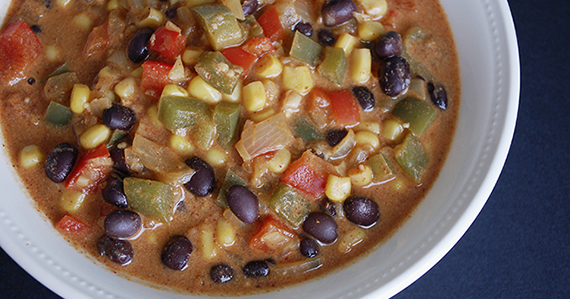 UPDATE: Now, my husband says THIS recipe is his favorite! When I pressed him, he admitted that between the two, his favorite is the one that is in front of him at the time! I’m back! Sorry for not posting for so long, but as you know, I’ve been on a scholarly sabbatical. I’ve gone back to school, full-time, to finish up my undergraduate degree, majoring in Communication Studies with a concentration in Health Communication. Fitting, right? Going back to college has been one of the best things that has happened to me. I’m seriously having the time of my life. During the school year, I’m fortunate to have a wonderful husband who handles dinner for us. Now that I’m off for the summer, I have the time to get back to cooking. So what made me so excited, that I just had to share with you? Simply the best tempeh recipe ever! It’s from the cookbook “Isa Does It” by Isa Chandra Moskowitz. She writes the blog, Post Punk Kitchen, www.theppk.com. Tempeh is a fermented soy food, and when made with organic or non-GMO soy, it is very healthy for you. This tempeh turned out so good, that it’s hard to only have one serving. 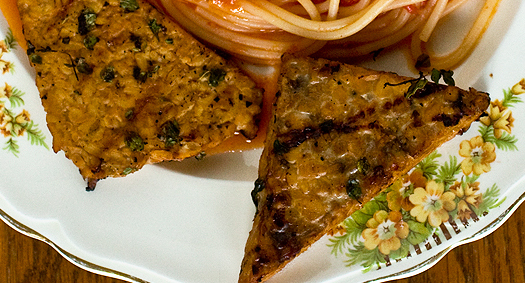 The marinade infused the flavor completely into the tempeh. It will be wonderful in sandwiches. I also believe that omnivores would love it. It is also super quick and easy. As you know, I am a big believer in using what you have on-hand. The ingredients are below, with my substitutions in parentheses. This made a lot of marinade. Since there was never any raw meat soaking in it, the marinade can be used again. You can dip your tempeh in it, au jus style, or use it for salad dressing. We finally took the time to sit down and watch Blackfish on Netflix. I’d been hearing about it for some time. It really is a must-see documentary. It cured me of a bucket-list dream I’ve had for years: to swim with the dolphins in a pool at a Hawaiian resort. Please take the time to watch the movie. Don’t forget to follow me on Twitter @Plantcentric!